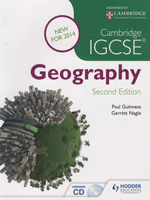 Cambridge IGCSE Geography, 2nd ed. This book has been carefully prepared to cover the full curriculum for the latest Cambridge International Examinations IGCSE Geography syllabus. It is accompanied by a CD-ROM offering study and revision support.